Indian Army-Military Recruitment 2019 has been announced for the below vacancies. Read the following Job Notification details to get a clear idea about Registration process, Eligibility, Qualification, How to apply, No of Vacancies, Salary, Job Location, Links to apply, Selection procedure, age limit and all the instructions before applying for this job. Click the FACEBOOK ICON below To get Alerts of All Job Notifications from WAY2TNPSC Interested and Eligible Candidates can apply before 09-May-19. Keep on reading this page to know all the above details. So, it will be helpful to know the procedure and details for the candidates who wish to apply for this particular vacancies. The Indian Army is the land-based branch and the largest component of the Indian Armed Forces. The President of India is the Supreme Commander of the Indian Army,and it is commanded by the Chief of Army Staff (COAS), who is a four-star general. Two officers have been conferred with the rank of field marshal, a five-star rank, which is a ceremonial position of great honour. The Indian Army originated from the armies of the East India Company, which eventually became the British Indian Army, and the armies of the princely states, which finally became the national army after independence. The units and regiments of the Indian Army have diverse histories and have participated in a number of battles and campaigns across the world, earning a large number of battle and theatre honours before and after Independence. The primary mission of the Indian Army is to ensure national security and national unity, defending the nation from external aggression and internal threats, and maintaining peace and security within its borders. 2. Physical & Medical Test. 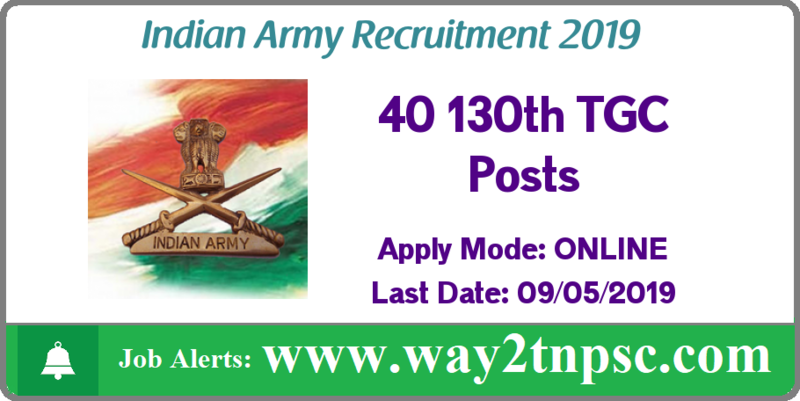 The above Notification ( Indian Army Recruitment 2019 for 40 130th TGC Posts | Apply online ) briefly describes about the details of latest announcement or notification includes important dates like release date , last date of application submission, details regarding fees, exam timings. Candidates, check all the needs and apply accordingly.